This is part of a nonprofit event titled Artists Work and painted by Overall Murals. Via email, I spoke with Angel Saemai, a partner of Overall Murals. The Third Street mural is based on an illustration by French artist Jules Julien while the Eighth Street mural is an original work by Spanish illustrator Gary Fernandez. "The goal of these installations is mainly to bring cool contemporary artworks and enlarge them into mural form — making them accessible to all people and for their and the neighborhood's enjoyment (hopefully! )," she said. Saemai said they only choose blank walls so not to paint over any existing artwork. So far, she said that feedback from East Village residents has been positive — "both for adding some color and life to the area as well as for the artworks themselves." And you can watch a time-lapse video of the painting here at Hugo & Marie. 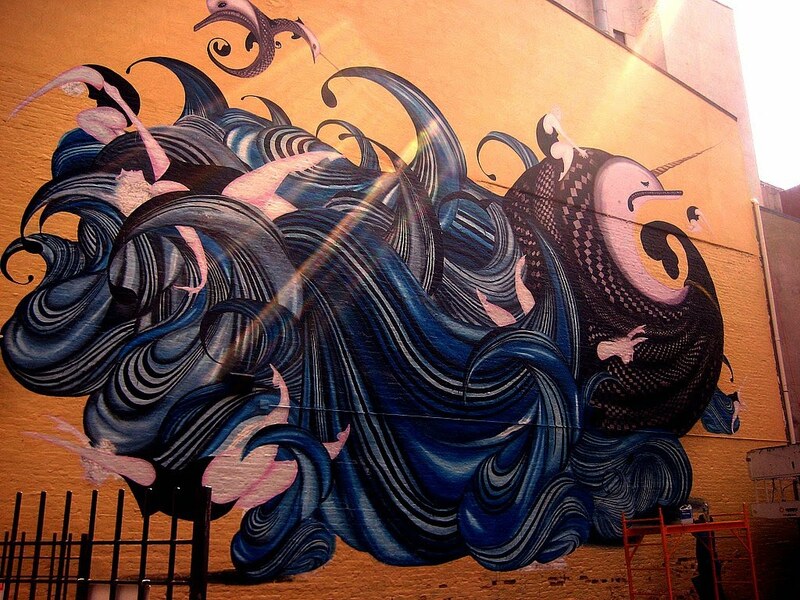 "We hope to make this an annual thing and make murals for different neighborhoods," she said. cool hopefully they stay up permanently. is that the case? I have some photographs of Yunnies and Yuppies that could be turned into large scale painted murals. They would similarly add some color and life to the area and do absolutely nothing to stop gentrification. I do think that the East Third Street and East Eight Street murals can actually further gentrification because gentrifier's will see them entirely as autobiography. People could also see them as harmless depictions of art as beauty, and what's wrong with that? What's wrong with that, is that beauty is everywhere. This project plays into the whole cleaning up and homogenization of our city. The good thing about Chico and other artists from the community is that they help preserve our history and flair. Both murals look great - more murals, please! Especially Chico. Love them! Art is art. Chico's, mine, yours...shouldn't matter. I checked with Angel — these are permanent. Ya know cookie, I wanna agree with you. But you are such a brainless, automated, typical, regurgitative tool. So which part do you wanna agree with? First of all these images are brought to us from Overall Murals - a registered outdoor advertising company that states: "New York City and Brooklyn walls are being transformed from gray to spectacular". Real estate developers and architects who have transformed the EV and LES think the same thing. I don't know either artists intentions but their content reads as, I wanna say, women in harmony with nature. The fact that the project runs throughout various neighborhoods in NYC and Brooklyn represents a forced solidarity with these neighborhoods, and that's a crock. Furthermore, I said that beauty is everywhere, I didn't say that ugliness wasn't. New Yorker! Not Horner, lol. Damn autofill. And *can't adapt. Oy vey. Hey Rock Horner.. What do you think of the changes on the Bowery..hotels, luxury housing, etc.? What do you think about the new ice cream parlor coming to 7th Street? Just curious? I liked it better what the copy space was a lingerie shop. With Via Del Pace and the church next door, you could plan out a whole weekend. Lingerie first, then dinner, then church? Dinner first, then lingerie, then church? Church first, then lingerie, then dinner? The funeral home across the street pretty much makes is a plan for life. 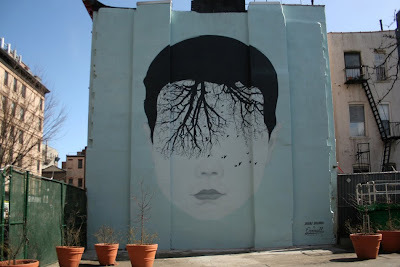 Wow I really love the mural with the face with the tree in front of it. It's very haunting. Way to keep the street pretty.